ShortScale :: View topic - MIJ Mustang - Stock Pickups? Replacements? Posted: Fri Nov 27, 2015 12:39 am Post subject: MIJ Mustang - Stock Pickups? Replacements? I finally broke down and got a Mustang. I have thought about it a lot but I am a bigger guy and they are smaller guitars but figure why not. I am pretty sure the owner may have just removed the covers but they may not be stock at all. What are some good pickup replacements for the MIJ Mustang? Novaks are probably the best. OK just get the standard '64 he recommends? 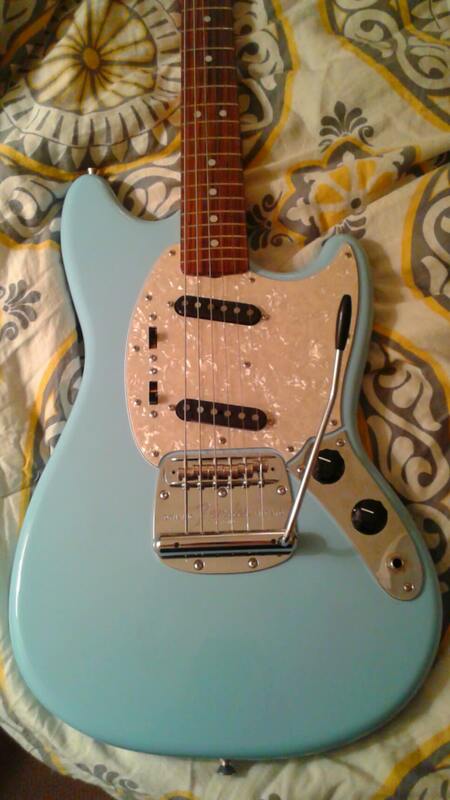 Also does any mustang pickguard fit the '65 MIJ? I would like to get a tort I think. Mij and us spec pickguards are different iirc. And you can't go warmoth because those only fit their own bodies. I think traditionally daphne blue had white pearl and black plastics and sonic blue had tort and white plastics, not sure what color that is and even then you're free to do your own thing. Re pickups, how do you like the ones in it? If you just want the stock look you can buy mustang covers for like $6 that should fit them just fine. But I would narrow down what you don't like about the pickups in it, then find out what they are and pick a direction from there. I just have seen the Stock MIJ stuff on Jaguars and I think even Jazzmasters have been not so good. I though perhaps the Mustang would be the same way. imo i would go into duncan or novak if ideia is more accuracy repro of true mustang tone. I have used GFS on strats and I like them for what they are. I don't see mustang pickups at GFS do I just do Strat ones? I also looked hard at the Gold foils they are making now. yeah, those pickups should fit. I think the MIJ '69 RIs started the blue+tort thing and the only 60s stangs with tort were the white ones. I always assumed it was a cost cutting measure as, at least in the US, they only sold the white and blue ones and it was probably much cheaper for them to not need different colour pickguards, covers and switches. Only the Squier VMs have ever repeated this, though they have a red one that's got the plastics the blue one should have so that one was probably actually influenced by the Japan RIs (not an unsavvy move given the amount of times In Utero Kurdtz was photographed with a SB+tort MIJ). had a convo with the rosepickup guy someone turned me on to. Nice guy and the price was good, I may be trying those out soon. It actually gets here today so I should know a little more. I guess we all kind of "dream about" what we want before it actually happens. Right? i have a set of rose alnico 3 strat pickups. very nice and yeah, not expensive at all.